As travellers we know perfect weather doesn’t exist. Even our most well-intentioned travel plans throw us climatic curve balls. We’d best be prepared! When travel is as unpredictable the weather we’re confronted with, it’s important to fill your travel backpack with all the right gear. No, staying comfortable while travelling isn’t always easy. But if there’s something you absolutely shouldn’t skimp on, it’s proper outerwear. Need rainwear for your female travel buddy? Check out our top picks for the best women’s rain jackets! When choosing between rain jackets for your next trip, you’re hardly spoiled for choice. The selection here ranges from some of the most robust waterproof jackets for men to some of the best lightweight rain jackets that will shed off the elements while lightening your load. The name says it all: the Patagonia Torrentshell can take a bad-weather beating and come out on top. Since 1973, Patagonia has built its brand on quality and sustainability, and the Torrentshell reflects that mission perfectly. A 100%-recycled nylon lies at the heart of the jacket. With its H2No® Performance Standard barrier the Patagonia Torrentshell shields you from the elements while remaining comfortably breathable. Extra ventilation via the armpit zippers cool you down even further when the temperature starts to creep upwards. As one of the more eco-friendly options on the block, the Patagonia Torrentshell gets a huge thumbs up for green travellers. Not only does the jacket aim for sustainability, the function is impressive. The DWR (durable water repellent) is among the best in the price range. Although the material on the Patagonia Torrentshell is a champion against nasty weather conditions, breathability isn’t one of the jacket’s finest points. It’s perfectly comfortable in most situations, but a scorching heat wave or extended strenuous activity will leave you wishing for an airier model like the Arc’teryx Norvan SL. As far as lightweight waterproof jackets go, it’s going to be challenging to find a competitor that takes down the Arc’teryx Beta SL. Weighing in at 315 grams, you’ll hardly even notice this infinitely packable jacket, whether in your backpack, carry-on or daypack. The secret is in the N40r GORE-TEX® fabric. It’s not just lightweight and packable, but breathable. The design for the Arc’teryx Beta SL is purposely minimalist, with only some sacrifice to watertightness and durability noticeable. Micro-seams are sealed with a 13mm GORE® seam tape that keeps you dry while maintaining the jacket’s light weight. Travellers dead set on keeping it light will love the next-to-nothing weight of the Arc’teryx Beta SL. It hardly occupies any space in your daypack, saving room for other travel accessories. The lightweight breathable fabric is comfortable for travel activities while the simple, minimalist aesthetic blends equally well on the trails and the streets. The Arc’teryx Beta SL is designed for quick emergency use, not all-day wear in inclement conditions. Although the jacket is waterproof and breathable, the minimalist construction sacrifices some durability to maintain its ultralight weight. The jacket will hold up to some abrasion but would not be suitable for outdoor activities involving frequent physical contact with obstacles. 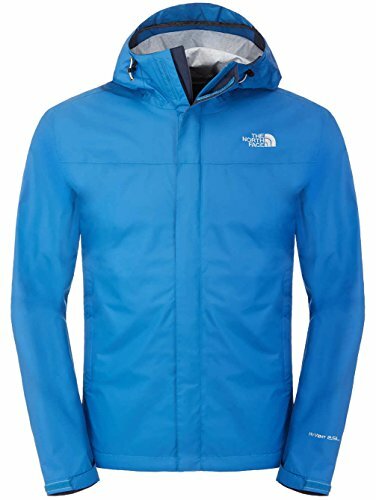 A jacket like The North Face Venture is more robust. Staying dry and comfortable is hardly a stretch of the imagination with the Outdoor Research Foray. A lightweight GORE-TEX® shell hooks you up with reliable protection from the elements while allowing for breathability. One of the best features is the TorsoFlo™ technology, a pit-zipper on steroids that opens up all the way from the hem to your biceps. What results is one of the most breathable waterproof jackets on the market. The Outdoor Research Foray is one of cooler men’s waterproof jackets thanks to the pit ventilation. The jacket’s breathable GORE-TEX® shell stays comfortable in most temperatures in the mid-range, when conditions are neither too hot nor too cold. A simple design moves between city and the outdoors with ease. There are certainly lighter jackets on the market than the Outdoor Research Foray. Travellers looking to keep their load minimal should look for a rain jacket with better packability and a lighter weight like the Arc’teryx Norvan SL. The jacket is marketed as all-season, but, realistically, it’s more suitable for three seasons in most climates. The Outdoor Research Foray is too warm to wear at the height of summer and not warm enough for winter in many North American or European destinations. In wearing the jacket during frequent heavy downpours, the durable water repellent finish (DWR) doesn’t always hold up. Cleaning the shell according to the instructions and drying can often help revive the DWR. 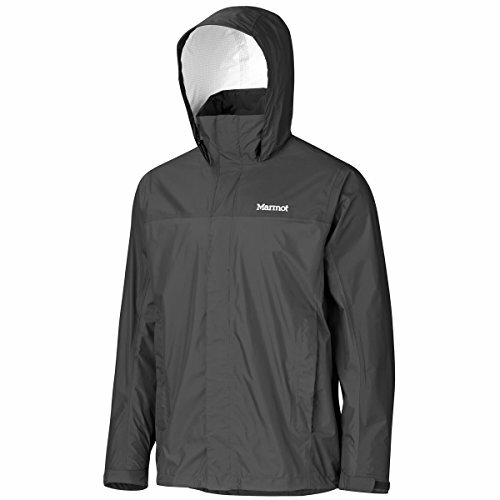 At over 300 grams, the Marmot Minimalist is neither the most lightweight nor minimalist of the top men’s rain jackets. Even if its name is a little misleading though, the Marmot Minimalist is a good fit for budget-conscious travellers. The Marmot Minimalist features a GORE-TEX® shell with Paclite® technology that’s normally reserved for more northernly price ranges. Pit-zips provide extra ventilation for active travellers needing to stay both dry and cool. As one of the cheapest waterproof jackets in our recommendations, the Marmot Minimalist should be top of mind for those on a tight budget. The jacket holds up in most “normal” conditions, but keep in mind that with the lower price comes the possibility of reliability issues. If you’re planning a trip to a place where heavy rains are common, the Marmot Minimalist might not be as trustworthy as other coats below. The GORE-TEX® with Paclite® is one of the company’s lower-end membranes and hardly as reliable as those found in higher-end men’s rain jackets. Although the jacket features three pockets, only the chest pocket is protected by a water-resistant zipper. You may need to look elsewhere if you need more dependable storage such as The North Face Venture. Few rain jackets for men are more versatile than the Outdoor Research Realm. This hardshell rain jacket sheds off the elements flawlessly with its special AscentShell™ fabric. The performance, from waterproofing to breathability, is comparable to the more famous, but more expensive, GORE-TEX® used in several of the best men’s rain jackets. Although it sits outside the ultra-lightweight category, the Outdoor Research Realm weighs in at just 308 grams. The extra weight is more than compensated for by the increased usability of the jacket. Unlike the lightest options the Outdoor Research Realm functions as a great all-day activity jacket, rather than just an emergency jacket, in a wider variety of conditions. Any traveller looking for an all-around rain jacket that prides itself on breathability and watertightness should give the Outdoor Research Realm a try. 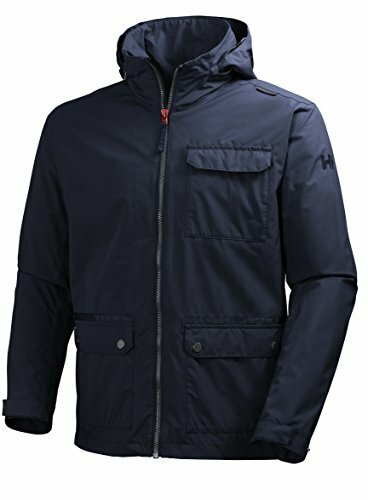 You may even prefer the feel of the unique AscentShell™ fabric over the GORE-TEX® common to many men’s waterproof jackets. If you’re simply looking for a jacket to keep you dry on the off-chance of a downpour, the Outdoor Research Realm might be more than you need. While still lightweight, others here are far more packable, lighter, and more suitable for infrequent use. The lack of pit-zip ventilation also leaves the Outdoor Research Realm faltering in the face of extreme heat. 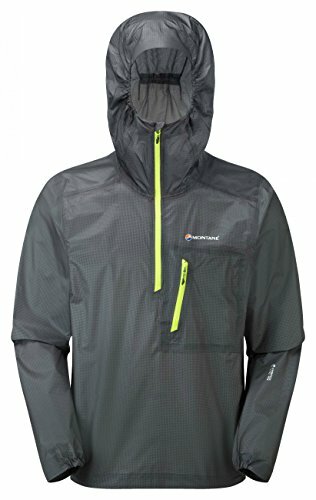 For anyone looking for an affordable rain jacket for casual use, the Marmot PreCip should scoot up the list. 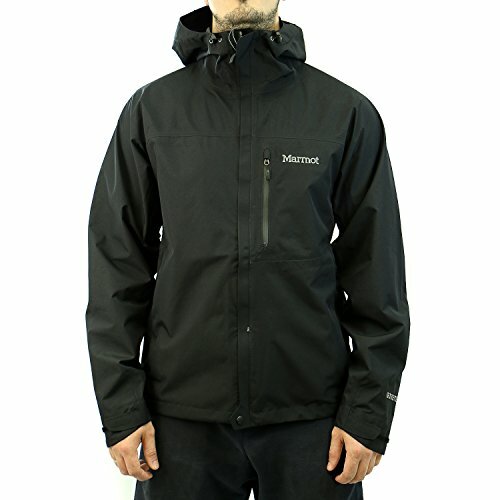 The jacket sports Marmot’s own NanoPro™ waterproof and breathable shell, a (much) cheaper alternative to the GORE-TEX® membranes used in most of the best men’s rain jackets. The Marmot PreCip offers simple standard features such as an adjustable roll-up hood and lined chin guard to protect your head and face from the elements. The main drawcard, however, is its affordability. Finding another brand-name rain jacket at this price point might well be impossible. Anyone on a tight budget should consider the Marmot PreCip before all else. In most common travel situations, the jacket will hold out well as emergency rainwear. It is, however, more well suited to light rains and as a temporary fix than a solution to a thorough day-long soaking. With the lower cost comes the trade-off of the Marmot PreCip being one of the least reliable jackets in the mix. While it will hold up to light rain, getting caught in a heavy downpour might leave you jaded. Anyone needing dependable protection—and willing to spend a little more for—should look elsewhere such as to the Columbia Watertight II. Priding itself on versatility, the Arc’teryx Zeta LT is the perfect companion for anything from urban backpacking to backwoods trekking. The lightweight and packable three-layer GORE-TEX® fabric is highly breathable and sheds off wind and water with ease. The Arc’teryx Zeta LT is among the most comfortable rain jackets on the list thanks to the GORE® C-KNIT™ (circular knit) backer. In bigger downpours the Arc’teryx StormHood™ secures with a single adjuster without impairing your line of sight to keep your head dry. 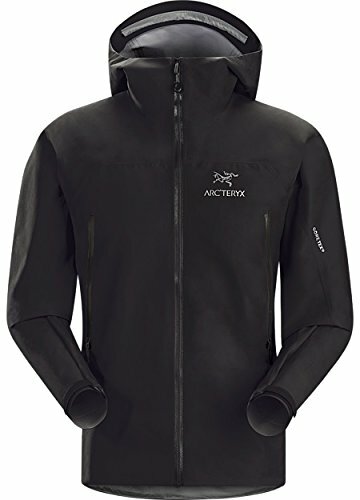 If you need a rain jacket that stands up to extended wear, the Arc’teryx Zeta LT is a good performer. The circular knit backer improves the jacket’s breathability and comfort, especially combined with the trim fit. On most wearers, there’s enough room for an extra layer underneath to extend the jacket’s warmth. While the Arc’teryx Zeta LT is a good all-around performer, the zippered pockets are merely water-resistant not waterproof. Items that could get damaged—such as a passport or compact camera—should be stored in the internal pocket rather than the externals. A favourite among minimalist packers, the Outdoor Research Helium II is among the best lightweight rain jackets for men—and certainly one of the most packable. Weighing in at 181 grams, it’s hard to find a jacket that you’ll notice less in your backpack than this. And that’s before knowing you can practically squeeze the Helium II into your pocket—it compresses as small as a protein bar! Watertightness on the Outdoor Research Helium II is provided by the Pertex® Shield+ shell. It’s breathable although the lack of pit-zips makes it more suitable as an emergency rain jacket rather than an all-day wear in warmer weather. Anyone who feels space is at a premium will love the ultra-compressibility of the Outdoor Research Helium II. It’s among the lightest offerings on the market, just shy of the ridiculously ultra-lightweight Montane Minimus 777 Pull-On. You’ll hardly even notice carrying it. At its more reasonable price point and with its full-zipper, however, the Outdoor Research Helium II defeats the Minimus 777 in practicality and budget-friendliness. With an intense focus on compressibility and weight, the Outdoor Research Helium II isn’t a good all-around choice for trips where you expect a large range of temperatures. The jacket functions best in mild weather—anything warmer will leave you feeling sticky. The Arc’teryx Norvan SL works much better in this regard. At an insanely feathery 120 grams, no ultralight men’s rain jacket impresses the scale gods like the Arc’teryx Norvan SL. The minimalist design uses the brand-spankin’-new GORE-TEX® with Permanent Beading Surface to offer up the most breathable shell on the market. The new technology allows the jacket to function without an external textile to weigh it down. What results is one of the driest, lightest and most comfortable rain jackets on the market. For trail runners or hikers, it’s hard to find anything that will match the vapour movement of the Arc’teryx Norvan SL. Travellers who find space at a premium or need to shed pounds of their carry-on luggage will appreciate the ridiculously light Arc’teryx Norvan SL. Among the best rain jackets for men, it’s also a top performer in warmer conditions. Even without pit-zip, the Venturi-style continuous ventilation is among the best in class for extended wear during outdoor activities. Depending on the weather conditions, the Arc’teryx Norvan SL might be too minimalist. Although the waterproofing and breathability are second-to-none, don’t expect the jacket to keep you warm in plummeting temperatures. The jacket appeals more to active travellers who work up a good sweat than run-of-the-mill urban explorers. What’s in a name? Apparently a lot. 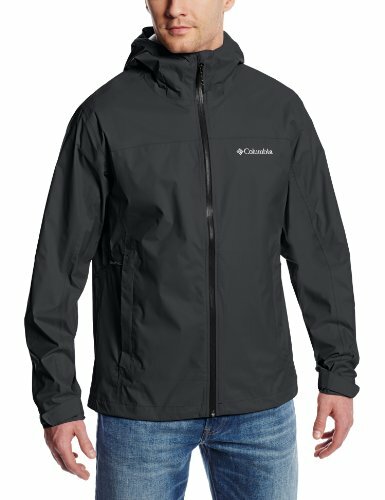 What makes the Columbia Watertight II such a compelling choice among the best men’s rain jackets is that it does exactly what is says: it simply provides excellent waterproofing and keeps you dry. It’s hard to find better value than the Columbia Watertight II. This ultralight rain jacket uses Columbia’s own guaranteed Omni-Tech® fabric that outfits both impressive waterproofness and breathability. Two zippered side pockets are perfect for stashing away valuables that need to stay dry for your journey. Nearly any traveller would appreciate the value of the Columbia Watertight II. 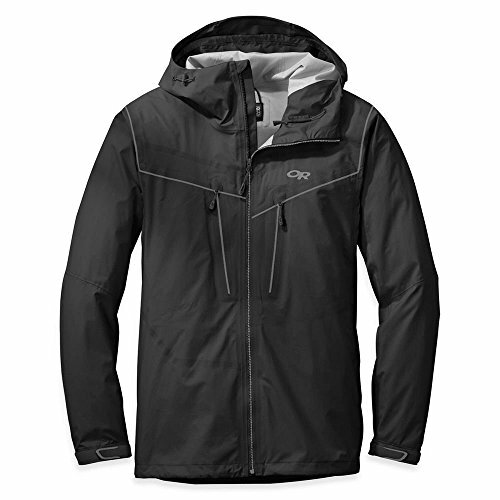 The proprietary Omni-Tech® fabric does as good a job at shedding rain as the more expensive GORE-TEX® membranes. In fact, there’s nothing else in the Columbia Watertight II’s price range that compares in terms of reliability. Even with the breathable Omni-Tech® shell, the lack of pit-zips push the Columbia Watertight II out contention for more active travellers. Rain jackets like the airer Columbia EvaPOURation and ultralight Arc’teryx Norvan SL offer better ventilation options. If you’ve grown weary of rain jackets that look like, well, rain jackets, buck the trend with the Helly Hansen Highlands. This jacket is easily the most stylish of the bunch, featuring a contemporary design of Scandinavian simplicity that’s as welcome on the streets of Paris as on the trail. The Helly Hansen Highlands features the company’s own Helly Tech® Protection for waterproofing. And it does quite a fine job, comparing favourably with the likes of the popular GORE-TEX® membranes found in so many other men’s rain jackets. It’s highly breathable, too. The cargo hand pockets and chest pocket add storage capacity and give the jacket a sophisticated explorer’s air. No wonder the Highlands is considered one of the best Helly Hansen rain jackets out there! Any traveller seeking a rain jacket that’s a cut above in style needs to add the Helly Hansen Highlands to their arsenal. Not only does the jacket look incredible, the waterproofing is stellar, keeping you dry in the harshest of conditions. The beautiful style of the Helly Hansen Highlands comes at the expense of the jacket’s weight and packability. If you need an emergency jacket to stuff into your day pack, the ultra-lightweight Montane Minimus 777 Pull-On or Arc’teryx Norvan SL are better choices. An intense focus on breathability defines the Columbia EvaPOURation, one of the top picks for the best rain jackets for men. With its classic simple Columbia style, the EvaPOURation sways between urban environments and the backwoods without a second thought. The function of the Columbia EvaPOURation rests upon the Omni-Tech™ membrane. With it, water is kept out without sacrificing much breathability. 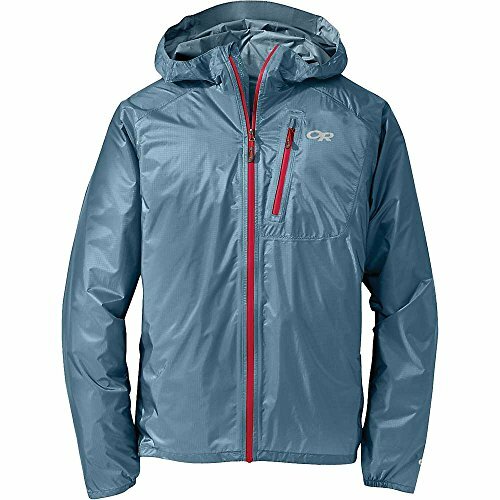 Where the Columbia EvaPOURation truly steps up though is with the Omni-Wick EVAP™ advanced evaporation system that gives the jacket its name. When the temperature kicks up a notch, the wick-ed fabric scatters sweat over a larger area to help it evaporate quicker. The underarm venting on the Columbia EvaPOURation, the only Columbia rain jacket in the series to feature it, speeds the process further. If you’re planning to get active on your travels (or are travelling to a warmer destination), the spectacular ventilation on the Columbia EvaPOURation is truly best-in-class for the price range. On top of that, when considering how well the jacket holds up in the elements, finding better value is tough. Only a small percentage of travellers would find their needs unmet by the Columbia EvaPOURation. When in need of something more stylish, The Helly Hansen Highlands makes a more satisfying statement. Striking in its simplicity, The North Face Venture delivers on both an elegant, streamlined style and reliable rain protection. A waterproof and breathable outer layer, designed to be as eco-friendly as possible, sheds off the elements to keep you as dry as possible in a variety of conditions. The zippered underarm ventilations adds extra air flow to cool you down as you scour the trails or the streets in search of the sublime. Two zipped hand pockets help you safely stash away your travel gear while the adjustable hood and chin guard shields you from harsh weather conditions. The simple yet stylish The North Face Venture is perfect for anyone needing excellent waterproofing at a good value. The breathability and extra ventilation in the armpits makes this jacket one of the better choices in warmer climates. Although certainly not heavy or bulky, The North Face Venture is not the most suitable candidate for stuffing into a tight corner in your carry-on luggage or daypack. The ultra-lightweight and packable Arc’teryx Norvan SL or Outdoor Research Helium II fit the bill better for minimalists. Most stylish: If you need to look good and stay dry, the Helly Hansen Highlands is the top choice. The design, based on a parka, adds an air of adventure and mystique that the sportier models simply don’t have. 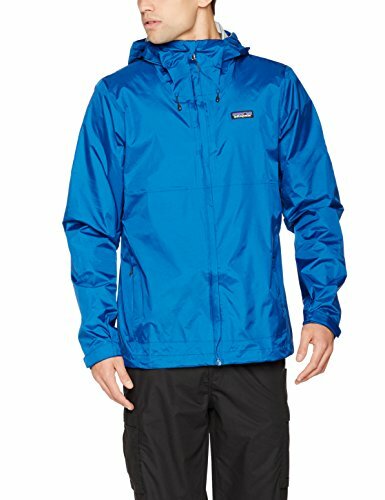 Best rain protection: Of all the jackets the Patagonia Torrentshell is overall the best performer in the rain. The hood keeps your face shielded better than most other competitors with the full-lined pockets reliably protect your belongings. Lightest and most packable: At just 120 grams, there’s no jacket that’s lighter than the Arc’teryx Norvan SL. So light, you’ll hardly even notice it in your daypack! Best value: As an overall performer, the Columbia Watertight II is your best choice in the mix. 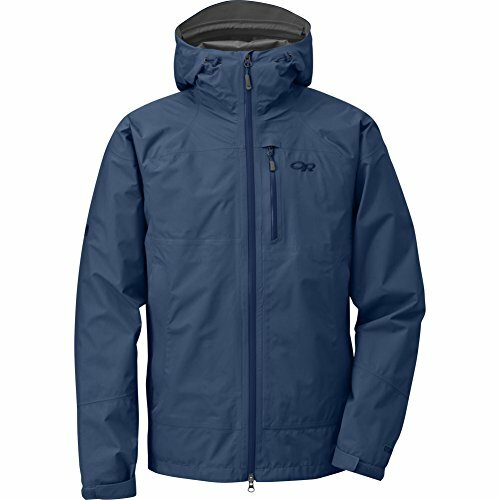 It equals or even outperforms many other top jackets in both reliability and comfort at a more reasonable price point. Sitting near the top among ultralight rain jackets, the Montane Minimus 777 Pull-On is about as light as they come. The jacket’s design pushes minimalism to the extreme, weighing in at a scant 140 grams. Less than the weight of a baseball! The PERTEX Shield+ fabric provides a breathable and waterproof shell in three layers. Seams are tight, featuring a 12-13 stitch count and micro-taped for breathability and watertightness. Unlike many men’s raincoats, the zipped external chest pocket on the Montane Minimus 777 Pull-On keeps water out with its special YKK® AquaGuard® zipper technology. It’s the perfect size to stow away your mobile or a small compact camera to capture your moments on the trail or the boulevards. Backpackers who take their packing weight seriously should consider the Montane Minimus 777 Pull-On. 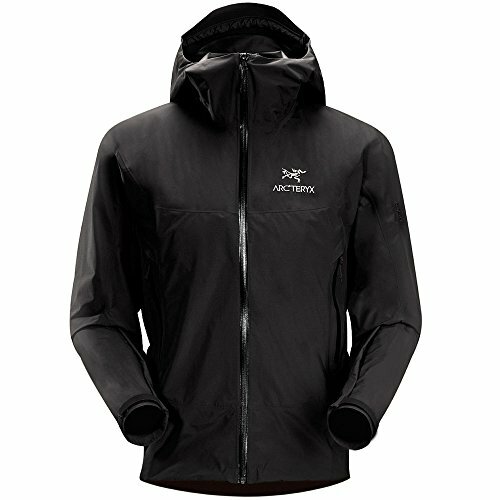 At just 140 grams, this rain jacket is, along with the Arc’teryx Norvan SL, in rarified air. And surprisingly durable considering. With an obsession with minimalist design comes a trade-off. The Montane Minimus 777 Pull-On is most suitable for mild weather. There are no pit-zips for increased ventilation, so in hotter climates, the Montane Minimus 777 Pull-On does not shine. Likewise on very cool days. Budget backpackers may also find the price of the Montane Minimus 777 Pull-On off-putting. 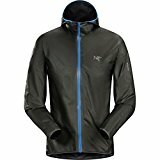 Other competitors like the Outdoor Research Helium II and Arc’teryx Norvan SL pull the same job off similarly at a lower price point. And as full-zip jackets, some travellers might find these options more appealing. A rain jacket could be one of the most important pieces in your travel gear arsenal. It’s rare to find a travel destination where staying dry isn’t at least a minor concern. In some of our favourite places–whether Iceland, Bali, Taiwan or Scotland—getting drenched is almost inevitable. Still confused and can’t decide? Let this buyers’ guide help push you towards finding the perfect rain jacket for your next trip—and many more to come! Effective waterproofing starts with the fabric. All the rain jackets reviewed here use either a 2-, 2.5- or 3-layer shell. Where it gets confusing is that all three share the same basic design principles. It’s not always easy to spot the differences at a quick glance. Differentiating between the three different layered shell constructions boils down to the inner layer. But before we get ahead of ourselves, let’s look at what to look for in each of the layers. The so-called face fabric is the outer layer that is the jacket’s first defence against the elements. This layer is generally coated with a durable water repellent (DWR) for protection. The DWR coating ensures that the face fabric doesn’t absorb water and weigh down the jacket, impacting its comfort. It would seem logical that the outer layer is the most important, but the real rain jacket magic happens in the middle layer. The strength and design of the waterproof membrane, wedged unseen between the outer and inner layers, is where the R&D dollars float away and separate the bad from the good and the good from the great. Most waterproof membranes share similar characteristics. All are designed with the goal of preventing liquid water droplets from entering the jacket while allowing water vapour to escape. The most famous waterproof membranes—and a staple among many of the top men’s waterproof jackets—are those designed by Gore-Tex. Their polytetrafluoroethylene (ePTFE) membranes are among the best in the industry, but also some of the priciest. Other manufacturers like eVent go even further by treating their ePTFE membranes with a special process that coats individual fibers instead of clogging the material’s pores for better breathability. 3-Layer: In addition to the DWR-treated outer layer and the waterproof membrane, a third layer, usually a polyurethane (PU) film, is added. The third layer protects the membrane from oils and sweat to ensure it remains breathable. 2.5-Layer: Similar to a three-layer fabric, but with a thin PU coating applied directly to the back of the waterproof membrane. The 2.5-layer construction is lighter but often less comfortable as sweat clings to the inner layer. 2-Layer: Features a loose mesh instead of a PU-based inner layer. Two-layer jackets are generally less expensive than 2.5- and 3-layer, but tend to be less packable and slightly heavier. For most travellers, aiming for the lightest rain jacket that still fulfills your travel needs is a good goal. There is a trade-off, however: The research and engineering that goes into reducing materials without sacrificing quality or creating new lightweight fabrics doesn’t come cheap. Many of the lightest and most packable rain jackets are also among the most expensive. Another consideration is that ultralight rain jackets don’t suit all weather conditions. In cooler climates, you might need to look to something a little heavier—or expect to dress in layers—to stay comfortable. Waterproof membrane technology is always improving, especially in terms of breathability. Most of the mid- to high-end jackets feature highly breathable membranes. The market leader for many years has been Gore-Tex, but fabrics like eVent and proprietary technologies are catching up. Some models also feature armpit or side ventilation for better airflow and extra comfort. If you’re travelling in hot and wet climes like Southeast Asia, the extra ventilation comes in handy.